All the Courses are conducted in the respective Faculties. In addition, some of the Courses are also conducted in Mahila Mahavidyalaya, BHU (MMV), Rajiv Gandhi South Campus, Barkachha, (RGSC) Mirzapur and the Colleges admitted to the Privileges of the University in the city namely, Arya Mahila Post Graduate College, Chetganj (AMPGC); Vasant Kanya Mahavidyalaya, Kamachha (VKM); Vasanta College for Women, Rajghat (VCW) and DAV Post Graduate College, Ausanganj (DAVPGC) . The total number of seats in various Courses is indicated in brackets where "M stands for Male only, "F for Female only, and "M&F indicates seats for Male and Female both. These Courses have been divided into "General Courses", "Professional Courses" and "Special Courses". BA (Hons)/ BA/B.Sc (Hons)/B.Sc under at least 10+2+3 pattern, securing a minimum of 50% marks in the aggregate including all subjects studied at BA/B.Sc level except those subjects where only pass marks are required and which do not contribute to the total in the final (degree) marksheet. Bachelor’s Degree under at least 10+2+3 pattern securing a minimum of 50% marks in the aggregate, including all subjects studied at Graduate level except those subjects where only pass marks are required and which do not contribute to the total in the final (degree) marksheet. Note: Candidate should be well versed in Hindi language, as the medium of Instruction for this Course is Hindi only). Graduate degree under at least 10+2+3 pattern securing a minimum of 50% marks in the aggregate including all subjects studied at Graduate level except those subjects where only pass marks are required and which do not contribute to the total in the final (degree) marksheet. Bachelor’s Degree in any discipline under at list 10+2+3 pattern OR its equivalent or a higher degree in any discipline from any UGC/AICTE recognized institution in India or abroad with a minimum of 50% aggregate marks. Bachelor‟s Degree in any discipline (such as BA, B.Com., B.Sc., BBA, B.Tech./B.E., etc.) under at least (10+2+3) pattern OR equivalent with a minimum of 50% aggregate marks. NOTE: In addition to the above that the candidates must have minimum 50% marks at Higher and Senior Secondary level with Mathematics as one subject. However, this course requires advance knowledge of mathematics. 15% seats out of total number of seats in M.P.Ed are allocated for female candidates; in case any such seats remain vacant, these will be filled by male candidates on merit. 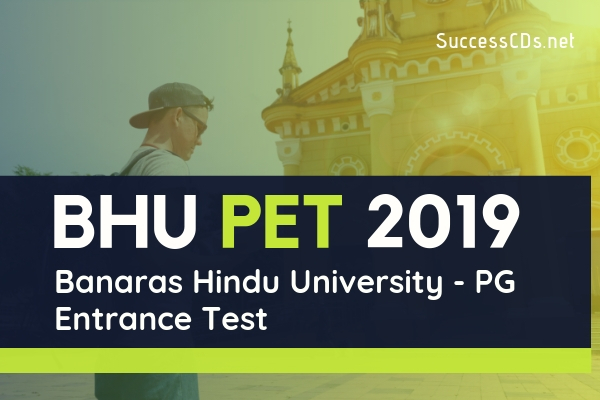 Accordingly, candidates may note that PET 2019 Information Bulletin and Application Form will not be sold (as there will be no offline mode) and the candidates desirous of admissions shall be required to register on the Entrance Test portal of BHU and fill up the application form ONLINE as per procedure provided on the Portal.